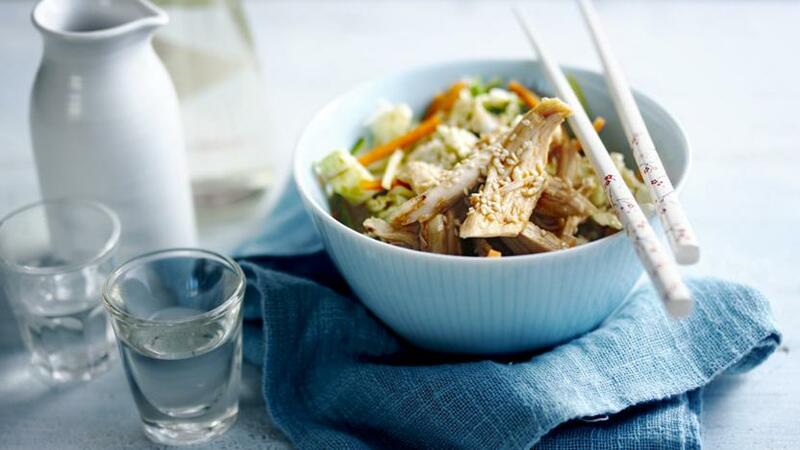 This spicy, crunchy salad is low in fat but full of flavour - perfect for a healthy dinner. Each serving provides 216kcal, 26g protein, 14g carbohydrate (of which 13g sugars), 6g fat (of which 1g saturates), 2g fibre and 0.9g salt. Cut the chicken into thin strips and mix with the honey, vinegar and soy sauce. Leave to marinate in a non-metallic bowl for about 30 minutes. Heat the sesame oil in a frying pan and cook the chicken over a high heat with any marinade for about 5 minutes until the chicken is cooked through, leaving some cooked marinade in the pan to use as the salad dressing. To serve warm, toss in a large bowl with the remaining ingredients and eat immediately. To serve cold, leave the cooked chicken and marinade to cool and then toss with the remaining ingredients.